A common refrain during a mahjongg game is: "Boy, did I go the wrong way." We all know what this means. A decision presents itself, as decisions do during this game. You must narrow your options and discard. Do you discard the two dot or the three bam? "Sorry, sorry. I gotta make a decision." "Okay," you say. "Three bam." What's the next tile you pick? You got it - three bam. You smack your forehead and rue the day you learned to play this fickle, cruel game. But wait! Can these "oy vey" moments be avoided? 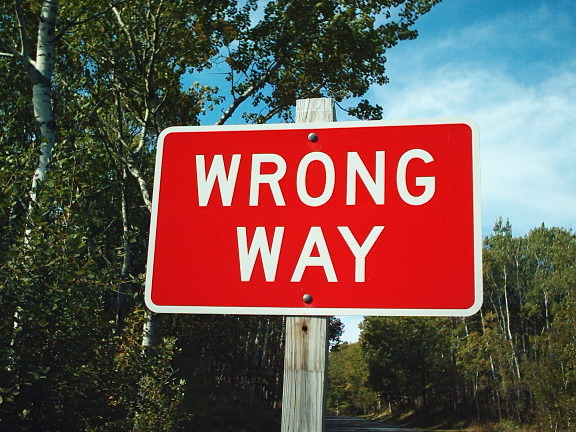 Is going the "right way" really a matter of luck? Well, sometimes yes and sometimes no. I played in a tournament last week and had three potential wrong way moments in three different games. When I looked closer I saw that it wasn't a matter of luck but a matter of inattention. In game one, it was time for the second "must" across. I had in my hand: NNEEWWSS67784F. I had to pass three, but which three? I passed the four bam, flower and an East. My rational was that winds were going around and I would get it back. SCHMUCK!!! As soon as I let it go I knew I had done the wrong thing. If I had been more alert I would have remembered that I had a third 7 dot that I passed away. The East never came back but the 7 dot did. The East fell right away, and the third one fell soon after and that was the end of me. WRONG WAY! My bad decision during the Charleston doomed me. In game two, I was set up very nicely with FFF33444455GG. Somebody threw a flower and I called it. Uh-oh. Should I go FFFF33334444GG or FFFF44445555GG? Gotta decide quick, but how? A quick check of the table showed one 3 bam out and one 5 bam. The game was half over, so how do I interpret this? Could go either way, right? Okay, I threw the 3 bam. Bang, right away it was called as an exposed pung with a joker. Lucky me, I'm set, I thought, as I picked a 1 dot, exchanged my other three bam for the joker and then threw the 1 dot. Bang! That got called too. By the same person. So she has three one dots and three three bams exposed. DOH! And I'm sitting set for a 5 bam. Now everyone knows that five bam is a hot tile and it doesn't get thrown. Wall game. WRONG WAY! But how was I to know? I couldn't have known. It's possible if I had thrown the five bam she wouldn't have had the jokers to cover it for a kong, but then I wouldn't have been able to exchange for the joker. But logical thinking didn't stop me from kicking myself from going the "wrong way." The third game I wised up and used my noodle with good effect. I was playing the pairs hand - 998 99887 998877 I had all my nines to start, which is the foundation for this hand, but towards the end of the game I found myself in this position 998 9987 998877 when I picked a seven dot. So the hand looked like this: 9987 9987 998877. I needed to get rid of a seven, but which one, and how do I decide which one? If I had discarded the seven crak, it would make me set for an eight dot. If I discarded the seven dot it would make me set for an eight crak. Time to scan the table. There were no eight craks out and two eight dots out, which made the decision easy to make. If a tile isn't out by the middle of the third wall, it is safe to assume it is being used in someone's hand. Two eight dots on the table made it a relatively safe discard for someone who was close to mahj - someone who might think twice about throwing a "hot" tile, an eight crak. So I could throw the seven crak with confidence, and sure enough the last eight dot got thrown a few tiles later. WAY TO GO!